My original intention when I started this post was to review the first story of the new season of Doctor Who, currently showing on BBC America Saturdays at 9:00 EST. As it turns out, however, I seem to have a few more thoughts on last season, and the show in general, than will fit in an introductory paragraph. So this is a sort of preface, for what it’s worth. Reviews of the new season—shorter ones, I hope—will follow. Doctor Who has enjoyed almost unprecedented longevity. The show first premiered in the U.K. almost 48 years ago, the day after JFK was shot. It went on a 16-year hiatus in 1989—except for an unsuccessful attempted relaunch in 1996—but novels and audio plays and comics kept the stories flowing until its triumphant revival in 2005. One of the reasons for the franchise’s durability is that the premise is so brilliantly constructed; I doubt anyone involved in the creation of Doctor Who would have predicted that the show would be thriving well into the new millennium, but—whether by accident or intention—there’s no denying that they built this show to last. The main character doesn’t ever die, he simply “regenerates.” When ill-health forced the First Doctor, William Hartnell, to leave the role of the alien adventurer in 1966, some unsung hero at the BBC came up with the idea that the Doctor can grow a whole new body—and, in the process, develop a slightly different personality—whenever he is mortally wounded. The Doctor remains a mystery. When he first arrived in 1963, the Doctor was an enigma, a mysterious traveler without a name. 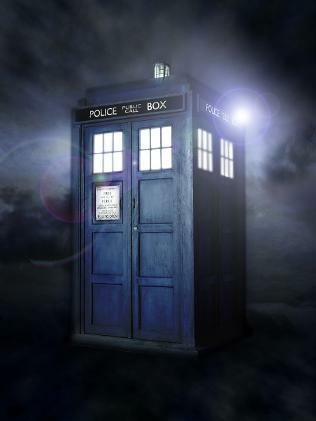 (“Doctor Who” is neither a name nor a title: it’s a question. He is simply called The Doctor.) Half a century later, he’s still an enigma. Over the decades viewers have seen occasional glimpses of the Doctor’s home planet, Gallifrey, and his people, the Time Lords, but of the Doctor himself almost nothing has been revealed. I’ve always thought the Brits understood better than we Americans do that sometimes we don’t want our heroes to be too human, too accessible, or too revealed. Like Sherlock Holmes, like James Bond, the Doctor remains a bit distant, a bit prickly, and more than a bit alien, and is far more fascinating for it. And in practice, this means that—despite nearly five decades of stories—the Doctor’s continuity is remarkably uncluttered. I have friends who are reluctant to get into the show because they assume there’s far too much back-story to ever get up to speed. In reality, however—while there’s a vast trove of material to go back and enjoy—there’s very little a new viewer needs to know. The Doctor is an eccentric, 900+ year-old alien adventurer who travels through time and space in a blue box called the TARDIS. He likes to have company, so he usually travels with a companion or two he’s picked up along the way. (Strangely, these companions are almost always attractive young women, though the Doctor’s relationships with his passengers have traditionally been strictly platonic.) 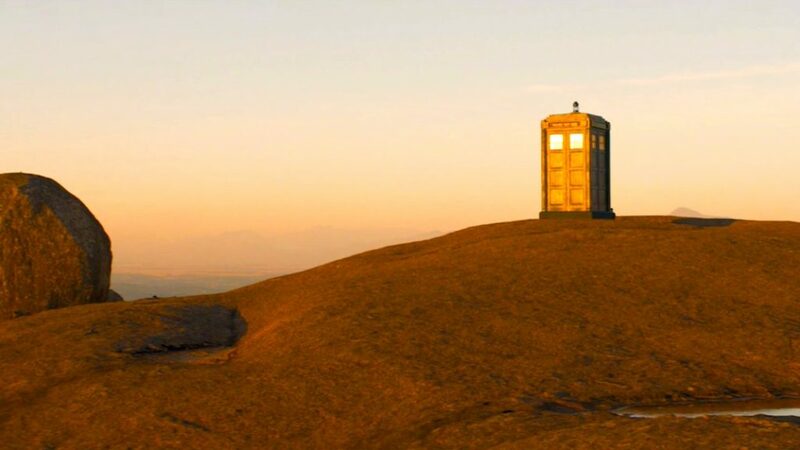 In the current incarnation of the show, even the Doctor’s home planet and people have been destroyed: the Doctor is now the last of his kind, a mysterious lone adventurer without past or home-port, without permanent ties or obligations of any kind. “I was starting to think you were just a mad man with a box,” his latest companion tells him—and he assures her that that is exactly what he is. Apart from the obvious charms, this flexibility also means that the show can tell any kind of story it wants, in any style: as scholar Matt Hills has said, the TARDIS is not a time machine: it’s a genre machine. Doctor Who moves effortlessly between science fiction, fantasy, comedy, horror, drama, farce, romance, and adventure—sometimes in the same episode. (Only Doctor Who could successfully juxtapose the absurdity of fighting a giant invisible turkey-monster with the heartbreaking depression and suicide of Vincent Van Gogh, as last season’s Richard Curtis-scripted “Vincent and the Doctor” did.) Like the One Thousand and One Nights, or The Twilight Zone, Doctor Who is as much an elaborate construction for telling stories as it is a story in its own right. This fool-proof formula—infinitely flexible, effectively indestructible— has worked for almost 50 years. Lead actors, supporting cast members, head writers, and executive producers have come and gone, and each has left their mark, but the show remains essentially unchanged. The current executive producer and head writer is Steven Moffat (creator of Coupling, Jekyll, and last year’s excellent Sherlock), and for his particular spin on the show we need look no further than this quote: “Doctor Who is a fairy tale. I don’t mean it’s like a fairy tale; I mean it literally is a fairy tale, far more than it’s a science fiction show, far more than it’s an adventure show.” Moffat quite rightly points out that, for all its sci-fi trappings, the show has magic at its heart, not science. The TARDIS is not really a space ship or a time machine: it’s a looking glass, an enchanted wardrobe, a twister that touches down just long enough to whisk you off to other worlds. Though he’s written some of the most acclaimed episodes for the series since it returned in 2005, the 2010 season was Moffat’s first as executive producer and head writer, and he hit the fairy-tale theme hard right out of the gate. In his first episode, “The Eleventh Hour,” a newly regenerated, somewhat raggedy Doctor (now played by 26-year old Matt Smith) crash-lands his TARDIS in the gardens of a girl with a fairy-tale name, 7-year old Amelia Pond (Caitlan Blackwood). She fixes him a meal of fish-fingers and custard, he helps her sort out a scary trans-dimensional crack in her bedroom wall, and then he leaves in the TARDIS with the promise that he will return in five minutes. Amelia—who has no parents, and who lives alone with her aunt in a house that is too large—has heard such promises before, and knows that sometimes people leave and don’t come back. But her new friend reassures her. “Trust me,” he says. 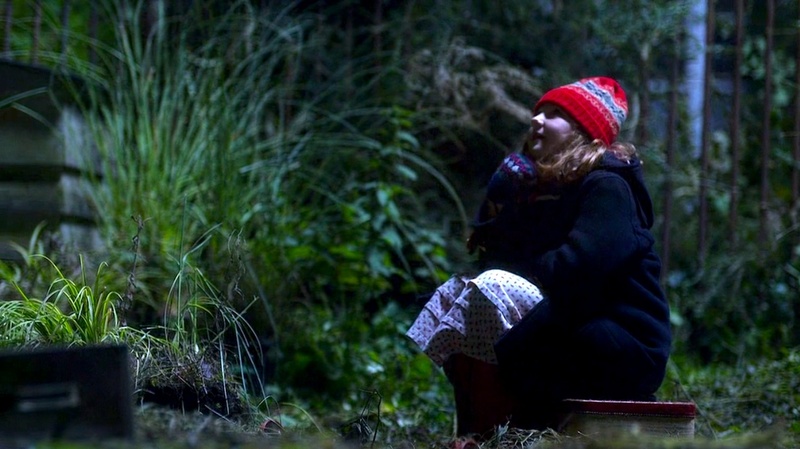 “I’m the Doctor.” So little Amelia Pond packs a suitcase, and sweetly—heartbreakingly—sits waiting in the garden for the Doctor to return and keep his promise. But he doesn’t come back. We all know childhood must end, and if stories go on long enough, there’s only one way they can end. Wendy “betrays” Peter Pan by growing up. Jackie Paper stops going to see Puff. Christopher Robin has to explain to Pooh that he won’t be able to do quite so much Nothing anymore. But imagine if your imaginary friend left you, long before you were ready to put away childish things. Imagine if you spent the rest of your life waiting for your imaginary friend to come back, growing less and less certain that he was ever real to begin with, growing more cynical and distrustful with every passing year. Amelia grows up to be 21-year old Amy Pond (Karen Gillan), having surrendered her fairy-tale name and most of her illusions. Over the years her family has dragged her to four different psychiatrists to get her to stop talking about her imaginary friend, and her long-suffering boyfriend Rory (Arthur Darvill) has waited years for her to stop waiting for someone else. And then, on the eve of her wedding, her imaginary friend finally comes back—he thought it was five minutes, but had a bit of trouble with the TARDIS—and Amy flies off with him at last. She is wearing her nightgown, like little Amelia did, like Wendy in Peter Pan. Meanwhile her wedding dress—the symbol of her transition to adulthood—hangs waiting in her closet. Significantly, previous companions have faced similarly stark choices. In the classic series (1963-1989), the traditional way to write a companion out of the show was to have her fall in love and get married. Even in the new series (since 2005), no one gets to have a romantic or domestic life and travel with the Doctor. Rose (Billie Piper), who travels with the Ninth and Tenth doctors, leaves behind her mother and boyfriend without a second glance, choosing the Doctor over anything resembling a real life: she has to be literally dragged away from him by force at the end of Season Two. 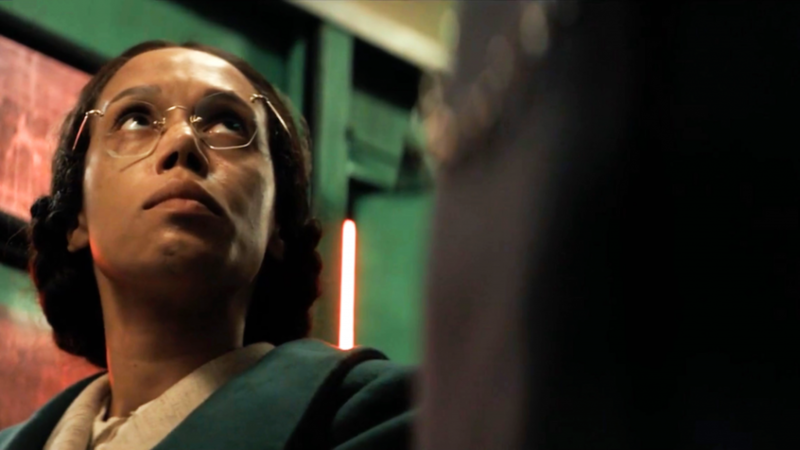 Martha (Freema Agyemen), suffers from unrequited love for the Tenth Doctor, and ultimately decides she must leave him and find someone who can love her back. When classic series companion Sarah Jane Smith (Elisabeth Sladen) returns in 2006, it is implied that she has just been pining for thirty years; offered the choice to travel with him again, she turns it down, saying “It’s time I stopped waiting for you and found a life of my own.” Most tragically of all, Donna (Catherine Tate), has her memories of traveling with the Doctor erased, and the suggestion is that she is now not only doomed to a life of boredom, but also doomed to being a more bitter and shallow person. You can have a real life, or you can have adventure and wonder, the show seems to say: you can’t have both. The Doctor makes the sacrifice, and reboots reality, and suddenly it is the morning of Amy’s wedding, and all is right with the world. She has her dress, she has her fiancé, she has her parents, and the marriage happens just as it should. Her life is perfect; her future stretches out before her. In the classic series, this is the moment when any other companion would leave the TARDIS forever, written off into domestic bliss, never to be seen again. But “someone is missing,” Amy realizes during her otherwise happy wedding reception. “Someone so important.” She is crying without knowing why she is crying, and she stands up during the speeches to start talking without knowing what she will say. As her parents groan with embarrassment, she starts talking about the imaginary friend she had as a child, the raggedy Doctor. 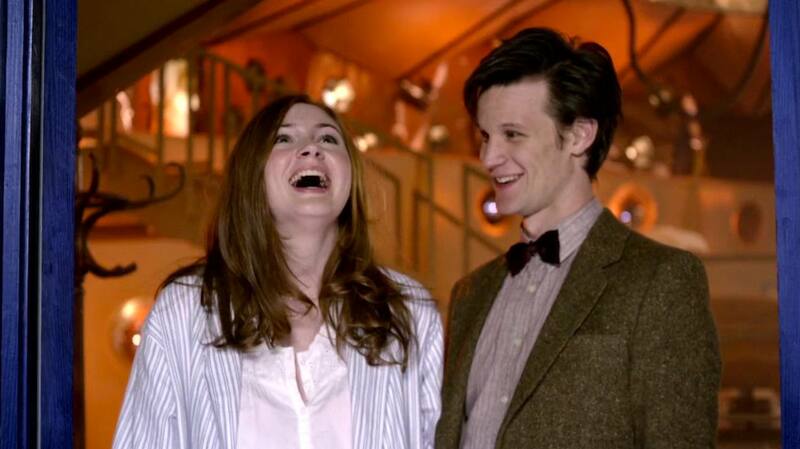 “Raggedy man, I remember you,” she calls out. “I remember you, and you are late for my wedding.” A wind picks up, the glasses start to rattle, and a familiar blue box appears on the dance floor: something old, something new, something borrowed, and something blue. As science-fiction goes, it’s a preposterous moment. (There’s more of an explanation for why it works than I’m giving here, but no parsing of the logic can make that explanation really make sense.) As a fairy tale moment, however, it’s glorious: the childhood hero summoned back into existence by Amy, who remembers being Amelia; the adventure rebooted by a grown-up unwilling to surrender the stories of childhood; the magic restored by a bride unwilling to choose between womanhood and wonder. The Doctor steps from the TARDIS, resplendent in top hat and tails, and greets the wedding guests. 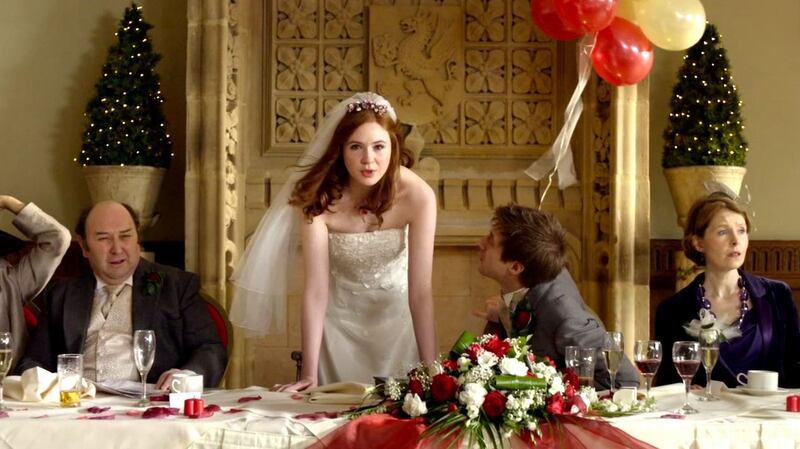 “I’m Amy’s imaginary friend,” he announces, shaking hands with the father of the bride. “But I came anyway.” Because why not? Why should growing up mean letting go of the comforts of childhood, the wonder and adventure, the faith in the impossible? (“It’s the Doctor. How could we forget the Doctor?” asks Rory, in what is both a sly aside to the years when Doctor Who was absent from British airwaves, and a reminder that adults need fun too.) At the end of the episode, the end of the season, Amy and Rory join the Doctor in the TARDIS for more adventures: the first married couple ever to do so. Whether zipping around time and space will be conducive to married life remains to be seen, of course. But Moffat’s first season serves as a metaphor for Doctor Who itself in many ways. The show first went off the air in 1989, and seemed doomed to stay that way after a misfired attempt to revive it in 1996. In Moffat’s story, 1996 is also the year that the Doctor briefly appears to, and then fails to come back for, little Amelia Pond, who must then grow up without him. 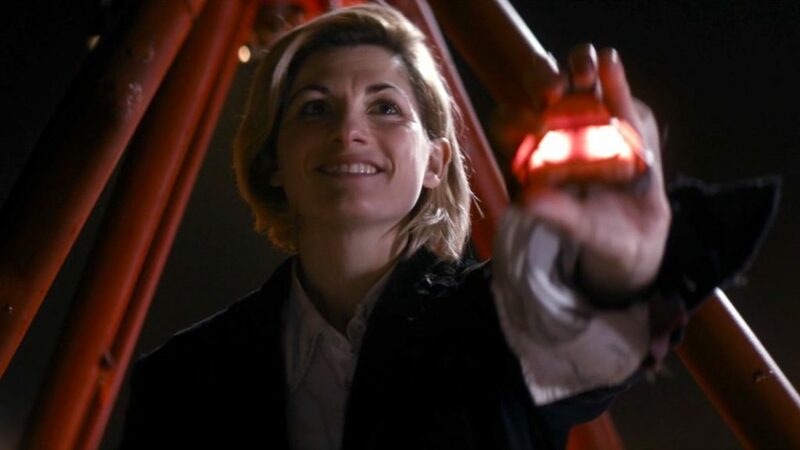 By the time he does come back for her she is an adult—just as every Doctor Who fan who loved the show as a child was an adult by the time it finally returned in 2005. I wasn’t one of them, for the record. While I have memories of watching Tom Baker and Peter Davison play the Doctor on PBS reruns in the early ’80s, I only really fell down the rabbit hole as an adult, when the series returned in 2005. By that time I too had put away most childish things: the comic books and fantasy novels and science fiction movies I’d devoured as a child had made way for “serious” art; the fantasy stories I wrote as a child had been shunted aside for more “literary” pursuits. As an adult I’d be lured in occasionally by some bit of pop-culture genre fiction—cf., Buffy the Vampire Slayer—but they were always guilty pleasures, a bit shameful, a little embarrassing. I’d play around with writing genre fiction, but it always felt like I was cheating on my “real” work. For all the reasons explained above—and probably some more I haven’t figured out yet—Doctor Who has changed all that. It has reminded me that adventure stories and fairy tales are important, and that we not only don’t have to give them up, we shouldn’t give them up. There are people who like to debate whether Doctor Who is a children’s show, but that just makes me think of Madeleine L’Engle, who said “if the book will be too difficult for grown-ups, then you write it for children.” Like television, like books, like the child in the man, Doctor Who is bigger on the inside, a perpetual machine for generating endless stories. It’s not a choice between adulthood and wonder, between the real world and the world of the imagination: like Amy Pond, we don’t have to choose. Just rented a David Tennant episode from the library and watched it with the kids – the one with two doctors. Of course the kids think the newest doctor is the best, because he was the one they saw first.